Who were these men? From what we can see in history, both were followers of the truth of God, and they carried out the work of the early Church. Polycrates oversaw the congregation of God’s Church in Ephesus and held to the doctrines of the early apostles. 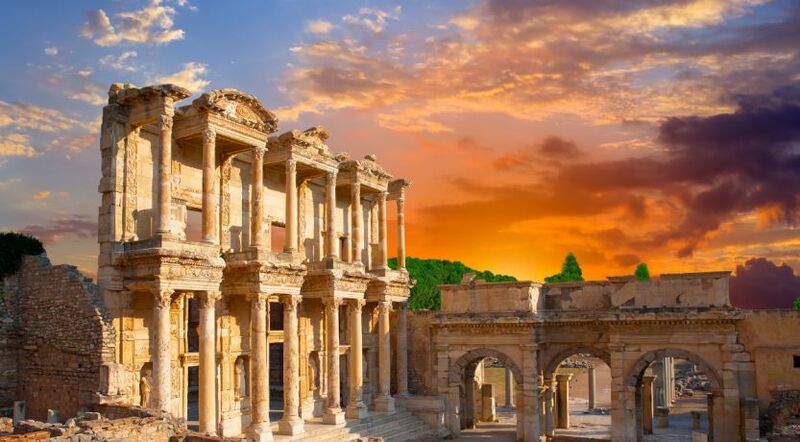 Pictured: Celsus Library in Ephesus. Jesus Christ said that He would build His Church and that the gates of Hades (the grave) would not prevail against it (Matthew 16:18). In a previous article, titled “Church History: The Ancient Nazarenes,” we looked at how the Church continued to thrive during the days of the apostle Paul and beyond. After the book of Revelation was completed (in the A.D. 94 or 95), we have only secular records to rely on for further church history. The information is sparse, but we can be confident that the Church existed because Jesus said it would. Thankfully, there are some historical accounts that give evidence that there were people who were loyal to the truth of God and that the Church of God was alive. That is why the stories surrounding Polycarp and Polycrates are very important to the topic of church history. “At this time, while Anicetus was at the head of the church of Rome, Irenaeus who was still alive, was at Rome, and that he had a conference with Anicetus on a question concerning the day of the paschal feast [Passover]” (paragraph 1). In history, this was called the Quartodeciman Controversy. “And when the blessed Polycarp was at Rome in the time of Anicetus, and they disagreed a little about certain other things, they immediately made peace with one another, not caring to quarrel over this matter. For neither could Anicetus persuade Polycarp not to observe what he had always observed with John the disciple of our Lord, and the other apostles with whom he had associated; neither could Polycarp persuade Anicetus to observe it as he said that he ought to follow the customs of the presbyters that had preceded him” (paragraph 16). Not only did Polycarp hold onto the truth, but also another church leader, by the name of Polycrates, also held firmly to these same teachings. Not only did Polycarp hold onto the truth, but also another church leader, by the name of Polycrates, also held firmly to these same teachings. Polycrates “presided over the church of Ephesus, in which the traditions of St. John were yet fresh in men’s minds at the date of his birth. He had doubtless known Polycarp, and Irenaeus also. He seems to have presided over a synod of Asiatic bishops (A.D. 196) which came together to consider this matter of the Paschal feast” (EarlyChristianWritings.com). “All these [the saints and bishops who were listed in his account] observed the fourteenth day of the passover according to the Gospel, deviating in no respect, but following the rule of faith. And I also, Polycrates, the least of you all, do according to the tradition of my relatives, some of whom I have closely followed. For seven of my relatives were bishops; and I am the eighth. And my relatives always observed the day when the people put away the leaven. “I, therefore, brethren, who have lived sixty-five years in the Lord, and have met with the brethren throughout the world, and have gone through every Holy Scripture, am not affrighted by terrifying words. For those greater than I have said ‘We ought to obey God rather than man.’ Acts 5:29” (paragraphs 1-7). Very strong and convicting words! Polycrates was not about to give up the truth about the Passover observance. He stood firm, as did Polycarp. The members of the Church under their leadership continued to keep the Passover on the 14th day. Eusebius continued his quote of Polycrates’ letter: “And they [the other bishops in his region], beholding my littleness, gave their consent to the letter, knowing that I did not bear my gray hairs in vain, but had always governed my life by the Lord Jesus” (paragraph 8). “Thereupon Victor, who presided over the church at Rome, immediately attempted to cut off from the common unity the parishes of all Asia, with the churches that agreed with them, as heterodox [not conforming with accepted standards or beliefs]; and he wrote letters and declared all the brethren there wholly excommunicate” (paragraph 9). Victor later relented, but we see a division here. What was believed by those in Rome was totally opposite to what had been taught by the apostles. These two historical figures, two loyal men of God, left a legacy for us to consider. First, we see that the Church Jesus started didn’t die out in the second century. There were congregations in Smyrna, overseen by Polycarp, and in Ephesus, overseen by Polycrates. Second, both men stood firm in their beliefs as they had been taught. They followed in the footsteps of the early apostles, and they didn’t mince any words regarding their beliefs. Polycarp eventually was martyred for what he believed. Polycrates was not heard from again.